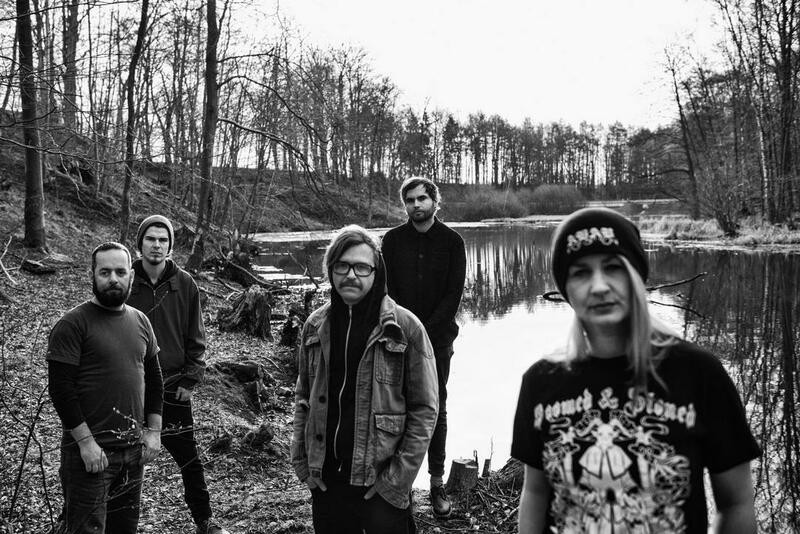 The German sludge/stoner group High Fighter are in the spotlight for this week’s Meet The Band. Their debut full-length album Scars & Crosses was recently released. Vocalist Mona Miluski, guitarist Ingwer Boysen and drummer Thomas Wildelau introduce us to their band. Heavy Music Headquarters: Give us a brief history of High Fighter. Ingwer Boysen: High Fighter was formed in the summer of 2014 after the split up of our former bands A Million Miles and Buffalo Hump. We worked on some material during that summer and recorded our five track demo EP The Goat Ritual by October. After we released it we got the chance to tour many parts of Europe and played shows with a lot of great bands such as Ahab, Mammoth Storm, Corrosion Of Conformity, The Midnight Ghost Train and Crowbar. Our first full length record Scars & Crosses came out on June 10th. Describe the songwriting and recording process of Scars & Crosses. Ingwer: The songwriting process started right after the live recording session of The Goat Ritual. It took about one and half years to get enough material together. Some songs needed to grow for a couple of months and others were done over a short period. In March 2016 we started to record for ten days with Jens Siefert of Rama Studio in Mannheim. On the one hand we had a good time, because it was nice to work with Jens and we were able to try out some fancy gear, but on the other hand it was also quite exhausting, because some of us were pretty sick most of the time. Mona Miluski: I think playing live as much as we did right after we released our first EP back in 2014 mostly influenced our further songwriting as well as the entire band. Being out on the road so much really got us together as a band in first place. When we recorded The Goat Ritual, we all just came out off different bands with different backgrounds, also to that date we had never stood on a stage as High Fighter. As Ingwer says, right after the release of our first demo we started writing the new songs beside playing live a lot. So these album tracks had the chance to grow also on stage while we played a lot of the album tracks over the last year and way before the recent album’s release. The new album Scars & Crosses sounds way more homogenous to me now then it did on The Goat Ritual back in 2014. I think we have found ourselves as a band due to playing live a lot, and this totally influenced the songwriting and recording process. The instrumentals on the new album have been recorded live in the studio as well. Ingwer: It is a mix between many kinds of heavy music and some other stuff as well. The album sounds dark and heavy, but there are also lots of bluesy and psychedelic elements to find. Mona: I always find it interesting, sometimes amusing, that people always have to categorize first. But it’s hard to do when it comes to High Fighter, as we are very open minded when we write our songs and we like to combine several styles into one sound…the High Fighter sound. We don’t try to be a pure doom band, nor do we try to be a pure stoner or sludge band, we just let it happen, and you will find a lot more in High Fighter. We mix all kinds of genres in our music and bring them together into one heavy sound, from blues, desert rock, sludge, doom or metal, we have a lot to offer. What I dig on Scars & Crosses most is that the beauty meets a lot of pain. This album is very ugly and painful on one hand, but so beautiful on the other one. How did you come to sign with Svart Records? Thomas Wildelau: We sent out some rough demos of tracks to a bunch of labels. Svart Records were one of them. Shortly after they received our songs, they got in touch with us and told us that they were interested in our music and getting us on their roster. We are really happy about how all this happened, because secretly we wished that Svart Records would sign us. Mona: We’re big fans of their label and roster. I also think they’re one of the coolest labels our scene has to offer, so we were stoked when they were interested. There were a few other labels who showed interest, but at that point we simply had to go with Svart. It feels like a perfect match as they totally get our sound 100 percent, and so far we feel more than happy, welcome and home at Svart. What has been your most memorable High Fighter live show? Thomas: It’s just the beginning of the band’s career, but if we look back in the year 2015, I remember our show on the Stoned From The Underground Festival. That was quite awesome! The gig in Paris last year in autumn, on our support tour for Ahab and Mammoth Storm, was amazing, too. Mona: Stoned from the Underground was a blast, our biggest show so far and it had such a great energy with an amazing crowd! The tour with Ahab and Mammoth Storm last fall has been really special to us. I also love to remember our first band-flight to Portugal when we played Sonic Blast Festival last year. We spent four days over there and had such an amazing time. I enjoy every single show we play, no matter how many people are in the crowd. Being out on the road and sharing intense vibes and energy on stage are always the best moments for us..
Ingwer: There are many bands we dig, like Black Sabbath, Queens Of The Stone Age, Faith No more and Tool, but I think this is different for each one of us. Mona: Every one of us listens to different styles and bands, this is what I find really interesting and I appreciate we’re such open minded band. We’re all influenced by desert rock, metal and blues, when it comes to my “heroes” I would definitely go with bands such as Kyuss, Pantera, Down, Monster Magnet, Crowbar or EyeHateGod. Mona: I am lucky enough to work in the music industry, so my day and life is almost surrounded by music only. When it’s not, I love being out in nature, taking care of my old horse, having animals, or just going out to shows and catch up with good friends. Ingwer: There is more than one I think. If I could choose three, it would be Safe As Milk by Captain Beefheart, Revolver by the Beatles and Suspended Animation by Fantômas. Mona: Cowboys From Hell by Pantera and Blues For The Red Sun by Kyuss. Check out our just released debut album Scars & Crosses, we hope you dig it. And cheers for having us!